The properties that made our top 10 list include scenic lakeside hideaways, top spas, eco-friendly accommodations and other vacation ideas for all budgets. Get away and relax surrounded by nature, experience new activities and reconnect with your loved ones. Most of the properties on our list are a quick drive from Toronto. Adventures to choose from include canoeing, yoga sessions, golf in the summer, snowshoeing in the winter.Here is our list of top 10 places to stay for couples and families with kids. The list includes luxury resorts as well as more affordable options. 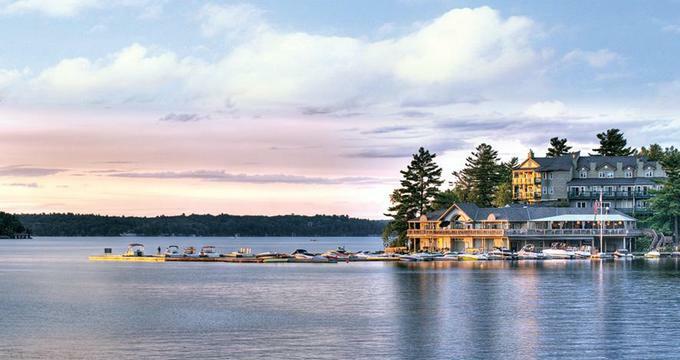 Located on the picturesque Lake Muskoka, Taboo Resort has a beautiful spa, great golf course and restaurants which offer dishes prepared with locally grown ingredients. The Premier Lakefront rooms are a great choice for couples who want a view of the lake through huge windows. Amenities include deep soaking tubs and private balconies, perfect for a breakfast on the lake. Families should book a Cottage Chalet which features two to four bedrooms, washer/drier, a full kitchen and an outdoor BBQ area. Enjoy organic oils and natural products at Spa Taboo which offers a diverse menu of services. Room rates start at $185 per night (800-461-0236, 705-687-2233). 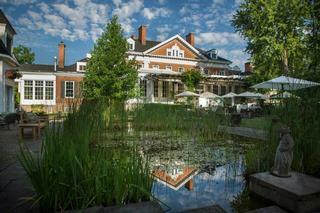 Get away for a couples weekend of great food and spa treatments in a peaceful country setting at Langdon Hall. The hotel is a member of the prestigious Relais & Chateaux hotel group, known for its five star service. Choose from 52 guest rooms and suites, featuring antique furnishings, baths with soaking tubs and walk-in showers. Ask for one of the suites with a wood burning fireplace and a private terrace overlooking the gardens. Langdon Hall is located in Cambridge, Ontario, about one hour from Toronto. Rooms start at $375 on weekends (519-740-2100). Located on 400 quiet acres in Grafton, Ontario, Ste. Anne's Spa is a beautiful escape from the city. 16 guest rooms at the Main Inn and 6 cottages are individually decorated in Old World style. Ask for one of the rooms with a romantic fireplace on your weekend getaway. All-inclusive rates start at $800 per night. In addition to overnight stays, Ste. Anne's Spa offers day spa packages starting at $170 per person which include lunch, afternoon tea, a $120 spa credit and complete use of the spa facilities (888-346-6772, 905-349-2493). Grail Springs is located in Bancroft, Ontario, in the heart of the Canadian Shield, surrounded by a pristine forest, meditation gardens and a beautiful lake. The resort offers a variety of accommodation options, including luxurious rooms with lake views. If you are looking to reconnect with nature, book one of the eco forest cabins in the summer. Grail Springs is a family getaway offering many activities, including yoga, snowshoeing, horseback riding, guided hikes and evening guest speakers. In the summer, enjoy the lake beach, canoes, paddleboats and the labyrinth. Spa facilities include an outdoor hot mineral salt tub, cold-plunge salt pool, outdoor dry Finnish sauna, steam sauna and infrared sauna. All-inclusive two-night retreats start at $480 per person, including all meals, activities and $100 spa credit (877-553-5772, 613-332-0154). A relaxing trip from Toronto doesn't have to break the bank. Stay overnight in a heated yurt or cabin in one of the provincial parks in Ontario. For example, Windy Lake Provincial Park has 4 new yurts where you can have fun outdoors year-round; this is one of the best cheap getaways from the city. Each yurt sleeps six people and is equipped with a table and chairs, lighting, electric heat and an electrical outlet. Outside the yurt, there is a fire pit, picnic table, and propane barbeque with side burner ( 888-668-7275, 519-826-5290). 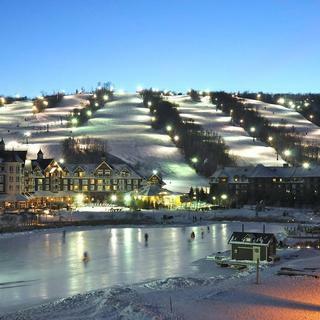 Blue Mountain Resort, just 90 minutes north of Toronto, is a year-round playground for kids and grown-ups alike. The resort offers diverse accommodations, a 40-acre pedestrian village, and 45 restaurants, bars and shops. There are two spas at Blue Mountain, as well as the nearby Scandinave Spa, perfect for a relaxing spa getaway in the mountains. If you are looking for spa retreats near Toronto, this is a great option. In the winter, guests have access to 42 ski and snowboard trails. During the warmer season, activities include golf, tennis, hiking, mountain biking, open-air gondola, Ridge Runner Mountain Coaster, Mountaintop Segway Tours and the Aquatic Centre. VacationIdea.com Tip: Look for last minute getaway deals. 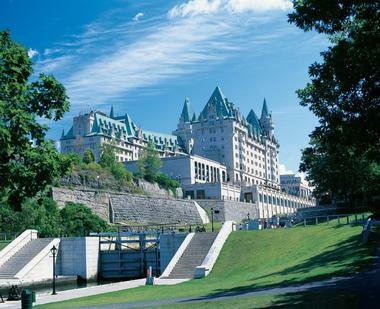 Fairmont Chateau Laurier is a historic city getaway in the heart of Ottawa. The hotel offers luxury guest rooms, classical interiors and a limestone exterior with turrets that will remind you of a French chateau. The hotel has a health club with a fitness center, a 20 yard art-deco swimming pool, dry saunas and a lounge area. For a massages or other spa services, visit the Holtz Spa across the street. During the summer months, Chateau Montebello, about a one-hour drive from the hotel, features a Stanley Thompson-designed golf course. For biking and skating, visit the Rideau Canal next to the hotel, or the nearby Gatineau Hills. The hotel has 398 guest rooms and 31 suites which measure at least 375 square feet in size. Stay in one of the Fairmont Gold rooms, located on a private executive floor, to get access to the executive lounge offering free breakfast buffet in the morning, hors d'oeuvres, internet access and shoe shine. Enjoy a meal with a view of Parliament Hill at Wilfrid's restaurant which offers a diverse menu that changes weekly. Bed and breakfast rates start at $225 CAD per room, per night, double occupancy. Weekend packages are usually available, letting you save money and enjoy free breakfast, massages and other perks. 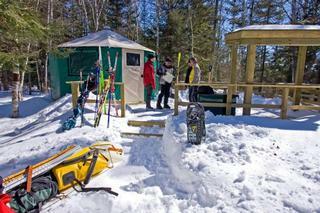 Kids stay free, making this one of the top family getaways in the area (613-562-7030. 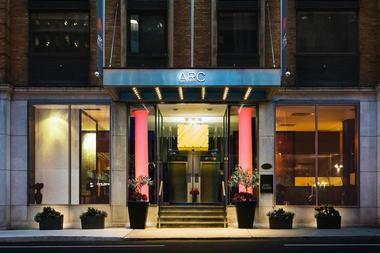 ARC The.Hotel is a boutique getaway designed and styled with urban luxury in mind. The property has 112 guestrooms and offers luxury amenities, including sparkling wine upon arrival, Egyptian linens, bathrobes, daily newspaper delivery, high speed Internet, and a 24-hour concierge. Choose from stylish rooms and upscale suites. The fitness center is open 24/7 and offers a range of cardio equipment and free weights. The hotel has partnered with Bode Spa to offer in-room spa services. The ARC Lounge has soft subtle lighting and intimate booths where guests are served delectable dishes. Rates start at CAD 145. Sheraton Hotel Newfoundland in St. John, is conveniently located in the historic city center overlooking the harbor. The hotel has a full-service health club with a heated indoor swimming pool, squash court and a fitness center. After a day around the city, relax in the whirlpool and the the saunas. The hotel has 301 rooms and luxury suites with bathrobes, daily newspaper delivery and a work desk. Both casual and fine dining are offered at the hotel. For a light meal, try the Narrows Lounge and Bar where you can taste local beer brewed at Quidi Vidi Brewery. The BonaVista Restaurant is a Mediterranean-themed restaurant with semi-private seating and an open-kitchen. 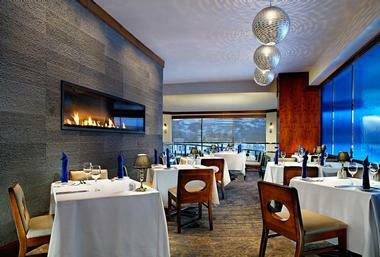 For great views of the Narrows and St. John's harbor, head to the elegant Cabot Club Dining Room. Fly to St. John in Canada and take a taxi to the hotel (709-726-4980). 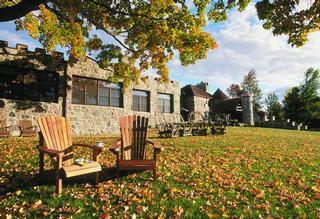 Fairmont Le Chateau Montebello in Quebec, is a hideaway for nature enthusiasts. Offering 211 guest rooms and Jacuzzi suites, this red cedar log chateau combines luxury with a wilderness experience. 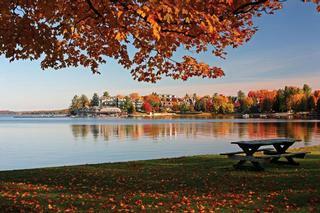 Montebello is set on the shores of Ottawa River with scenic views of the Laurentians. There is a number of activities to choose from throughout the year, including golf, hoseback riding, hiking, fishing, canoeing and skiing. Wildlife watching is also a favorite activity. The hotel offers Wild Bear Observation between May and October at the sister property Fairmont Kenauk. There is an abundance of mountain biking trails and abandoned forested roads. Bike rentals are available at the Sports Chalet. Indulge in relaxing spa treatments, including couples massages and other services. The Golf Club, designed by Stanley Thompson in 1929, feels secluded and features dramatic elevation changes. For families, the property offers several family activities. Kids can play in the outside play area, indoors in the craft area and swim in the hotel pools. French and English movies are presented at 7:30 pm daily. Whether you want an elegant meal or a quick snack, the hotel offers several dining options with an emphasis on regional dishes. You can dine outdoors, in the main dining room or in one of the many private salons. Bed and Breakfast rates start from $271 CAD per room, per night plus tax, based on double occupancy, from the end of June through mid-October; from $225 CAD per room/per night in the off-season. 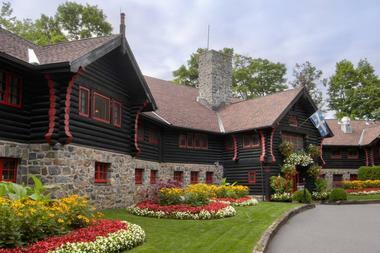 Montebello is located 1.5 hours by car from Montreal, Canada. Celebrate the holidays at a historic log chateau in Quebec, Canada with one of these holiday specials at a beautiful nature hideaway where you can relax in a calm setting with the whole family. If you are looking for a unique getaway for your holidays, the "Country Christmas Package" includes: Accommodation on December 23, 24 & 25, Christmas log and hot chocolate served on arrival, Two buffet breakfasts, one continental breakfast and Christmas Brunch, Three dinners, including the traditional Christmas Dinner, Christmas Eve "Reveillon" with a visit from Santa Claus, Family sleigh ride, Complete children's program, Dancing and entertainment, Complimentary access to the Sports Center, indoor pool, squash, outdoor skating rinks and cross-country ski trails. Rates start from $875 CAD per adult for 3 nights. Rates for Children sharing parents' room: 0 to 5 years old: $150, 6 to 12 years old: $255, and 13 to 17 years old: $405 for 3 nights. The "New Year's Gala Package" includes: Accommodation in a Fairmont room on December 31, New Year's Eve Gala Cocktail Party and Dinner Dance, Continental breakfast, New Year's Day Brunch, Complete children's program, Complimentary access to the Sports Center, indoor pool, squash, outdoor skating rinks and cross-country ski trails. Rates starts from $390 CAD per adult. Children sharing parents' room: 0 to 5: $50 CAD, 6 to 12 years: $105 CAD, 13 to 17 years old: $199 CAD. Fairmont Le Chateau Frontenac is a castle-like structure towering above Old Quebec City. Step back in time as you take a horse-drawn carriage ride and walk along the cobblestone streets of this historic city. With its regal rooms, attentive service and fine dining, the hotel is a great romantic city getaway in Canada. The hotel has a health club with a 55-foot indoor swimming pool, whirlpool and a kid's wading pool. Guests can work out at the fitness center and choose from a number of relaxing body treatments at the Massage Therapy Salon. The 618 guest rooms and suites are spacious and beautifully furnished. Signature rooms, measuring from from 275 to 350 square feet in size, are some of the best rooms in the hotel. 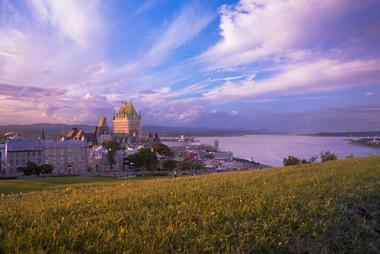 They overlook the St. Lawrence River and offer panoramic views of Old Quebec City. If you want more privacy and additional service on your city vacation, book one of the Fairmont Gold rooms. You will receive personalized check-in, private lounge access and a complimentary continental breakfast daily. In addition to central location in historic Old Quebec, a United Nations World Heritage Site, the hotel offers a number of vacation activities, ranging from ice skating to programs for kids. The hotel offers a number of dining options, including the elegant Le Champlain restaurant and the casual Le Cafe de la Terrasse. Who said Afternoon Tea was only for grown-ups? This family resort offers Tea Time for kids, a chance for children aged 5 to 12 to improve their social skills. Madame Rose makes the experience fun and memorable with exciting stories and anecdotes. Tea Time for kids topics include: tea place setting, story telling, how to eat and serve tea party fare, and how to be a well-mannered guest in any social situation. Tea time with Madame Rose is offered Tuesday, Thursday and Saturday afternoons at 3:00 pm. Other family activities include the daily drawing contest, kitchen visits & photo with Chef, milk & cookies turndown and guided tours of the hotel with historic character. Kids under 18 stay for free when sharing a room with parents. In addition, kids under 5 years old eat for free and 6-12 years old get 50% off meals. Romance package rates start from $349 CAD per night, per couple for a two-night stay. Romance package rates start from $349 CAD per night, per couple for a two-night stay (418-692-3861).